Plida - Scuole d'italiano per stranieri Società Dante Alighieri. The Dante Italian Language Schools are all Official PLIDA Certification Centres. 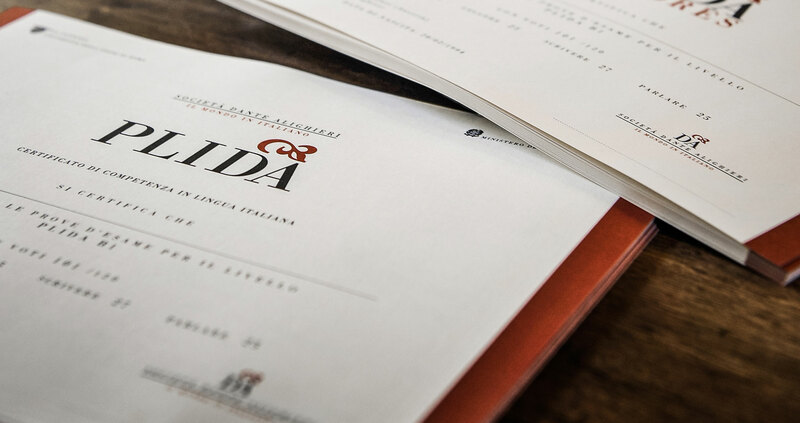 The PLIDA Certificate confirms competence in Italian as a foreign language and is recognised by the Italian Ministry of Foreign Affairs and International Cooperation, the Ministry of Labour, and the Ministry of Education, Universities and Research. The PLIDA exam allows foreign students to enrol in an Italian University with favourable terms. The PLIDA Certificate is issued by the Dante Alighieri Society and recognised by the Italian Ministry of Foreign Affairs and International Cooperation, the University “La Sapienza” of Rome, the Ministry of Labour and Social Policy, the Ministry of Education, University and Research, and by the Ministry of the Interior – to obtain the long-term residence permit and the citizenship. The Dante Alighieri Society is founding member of the CLIQ Association (Quality Certificate of Italian Language – Convention between the Italian Ministry of Foreign Affairs and the Certification Bodies). the citizens of the Trentino-Alto Adige Region to be exempted from the Italian language tests for the bilingualism certificate. if you meet all the requirements, by submitting a level B1 certificate.